I admit it. I’ve been spoilt for workspace in my time. A sweeping shared concrete desk at one of the UK’s coolest offices. A Brick Lane studio bedecked with giant Perspex lobsters. A suburban manor house. Over the past ten years, I’ve built my career against a backdrop of some truly awesome workspaces where my desk was only 1/10th of the entire experience. Now, like any good millennial, I don’t just want breakout spaces to escape to – I expect them. It’s not just about from making our mates jealous on Instagram Stories. (Well, maybe a little bit…) Breakout spaces are the real deal when it comes to boosting creativity and employee happiness. At Huckletree, and within the wider tech industry, breaking from tradition and building in playful casual working space has become the new norm. However, things are a little different for the majority of the population. A recent survey found that 56% of workers in the UK don’t have anywhere to eat their lunch apart from their desk. Aside from offering a far less dismal space to consume your Pret Christmas sandwich (it’s finally time! ), breakout spaces are vital for connecting with your community. Whether you’re in a shared workspace or not, work environments bring together hundreds of people at a time, all beavering away on world-disrupting work. We need relaxed zones where you can strike up a conversation without fear of intruding on a UX meltdown. As for Netflix reviews? Your desk neighbours don’t always have the headspace to debate the latest developments in The Good Place. It goes beyond building connections, too. Having issues knuckling down? We’ve all known a Milton, so having a choice of breakout spaces for escaping distractions is a necessity, not a luxury. As for the bigger picture, your HQ is just as much a signal of your culture as your values. If you’re on the hunt for maverick thinkers who are simultaneously being courted by Google, Monzo and ‘insert-hot-new-unicorn-here’, a creative, flexible workspace is a big factor in swaying your dream hire. Flashback to 2016, when I headed in for my first interview to join Huckletree. 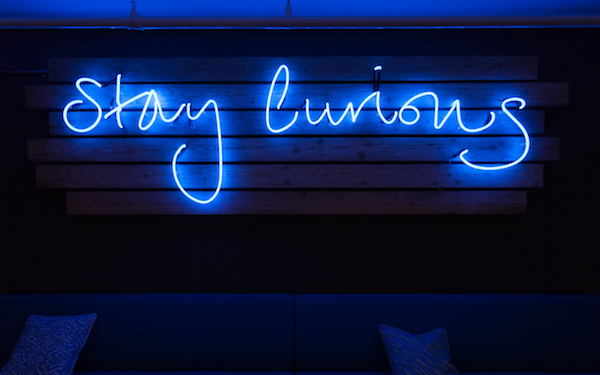 I loved the Alphabeta striped entrance, I loved the buzzing kitchen space – and I really loved the glowing neon lit couches where I met our CEO, Gaby. Towards the end of our chat, the question loomed in my mind: is it unprofessional to take a photo for the ‘gram in an interview? Rest assured, there’s no judgment here (did I mention we’re hiring?). Get that content – though probably after we’ve finished talking job specs. Designed by longtime Huckletree collaborators Studio RHE, the Curious Couches are a prime spot for meetings, tea breaks, hangouts and intense bursts of productivity. A corner nook offers issues of Courier, Monocle and some of our members’ favourite books. As for that ‘gram baiting neon? It’s an ever-present reminder of our value, Stay Curious. Based in the iconic Alphabeta, Huckletree Shoreditch is a contemporary reworking of an old-school London building. Think exposed concrete, neon and bold patterns. To complement this, we introduced a few softer elements to make sure our community feels at home. Head up to the ground floor and you’ll find our in-house Vertical Garden. Plant tendrils climb the walls, interspersed with a self-irrigating copper piping system. Members emerging from nearby phone booths are met with curling fronds and lush leaves – essentially, our very own jungle. Ever peeked into a terrarium and wished you were Borrower-size so you could explore it properly? That’s the vibe here. 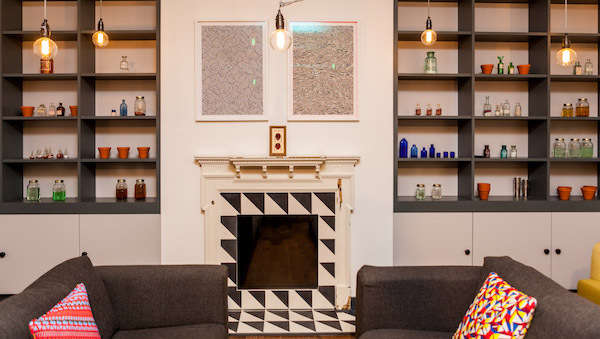 Tucked away on the lower ground floor, the Library is a Shoreditch member favourite. 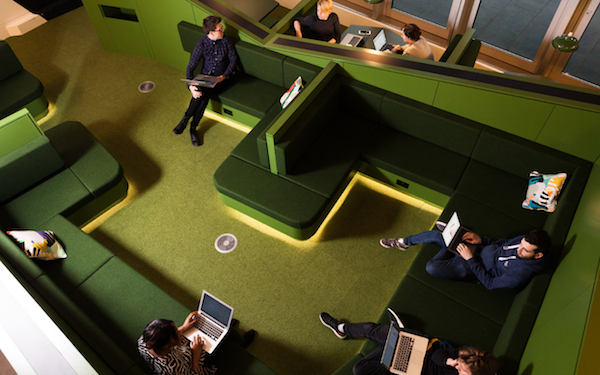 Booths for group work and several cosy sofas are adorned with pattern clash cushions by textile and graphic designer, William Branton. If it’s not a notification from that CXO Slack group, it’s a Facebook friendaversary roundup video popping up when you least expect. Our West London workspace is a passionate flag-flier for going tech-free – even for 15 minutes. 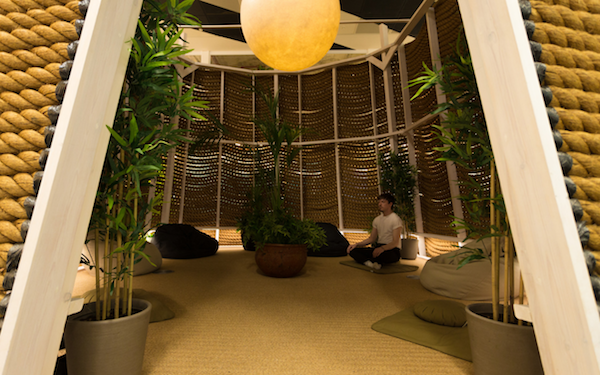 Ditch your iPhone, laptop and smartwatch at the door of our Meditation Yurt. Constructed from mariners’ rope, it’s dotted with leafy plants and a giant glowing moon is suspended from the ceiling. Built within our open plan, buzzing workspace, stepping into its interior feels a little like entering a cocoon: soothingly dim, muffled sound and super comfy beanbags. Aside from solo reflection, the Meditation Yurt has seen a lot of chilled out action in its time. From sage-infused Goddess Ceremony to weekly guided meditation, it’s a favourite spot for our West members. We’re not totally anti-tech at Huckletree West. 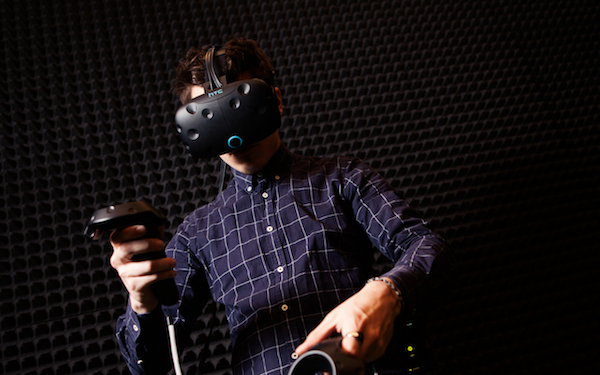 As a digital lifestyle workspace, we count some of the world’s best VR/AR/MR studios amongst our White City Place community, so naturally, we have an Immersive Studio. Built in partnership with leading VR/AR experts The Realities Centre, it’s our members’ go-to spot for game testing and good clean virtual fun. Missed our first Future Tech Takeover? Members Dream Reality Interactive gave hands-on demos of their hologram of David Attenborough and their soon-to-be-released experience Arca’s Path. Look out for regular gaming battles at Members’ Drinks – or challenge our Events Manager Kieran to a Beat Saber showdown. With curves straight out of Logan’s Run (minus the dystopian vibes), the Sunken Seating is a prime alternative to being deskbound. Floor to ceiling windows offer a sneak peek out onto our garden – and the Royal College of Art students’ ad hoc experiments. Look out for their mini crop of wheat! Why should you switch up your workspace through the day? Firstly, moving around raises your heart rate, get the blood flowing and gives you more energy to tackle that pitch deck. Secondly, a change in environment signals to the brain that you’re ready to concentrate on a new task. Bonus: the restful forest green helps enhance your focus. 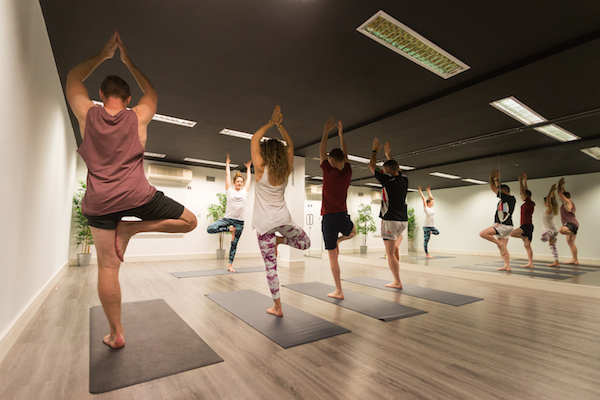 A few months ago, I hopped straight off a plane and straight into a yoga session led by our Huckletree D2 GM, Aislinn. I’m a naturally anxious person, with lists on lists on lists of things I need to get done/procrastinate about. Forcing myself to make time and bust that stresses can be tough when I’m running around from space to space. After a sweaty but soothing session with our Dublin crew, I’m pretty jealous of our members’ in-house studio, which sees a steady stream of yogis heading along to get their flow on. If you’re a yoga newbie, it’s time to get flexing. Studies have shown that even 10 minutes a day of yoga can cut sick days and improve productivity – not forgetting bringing the ‘ohm’ into your daily life. Breakout spaces don’t have to be indoors! 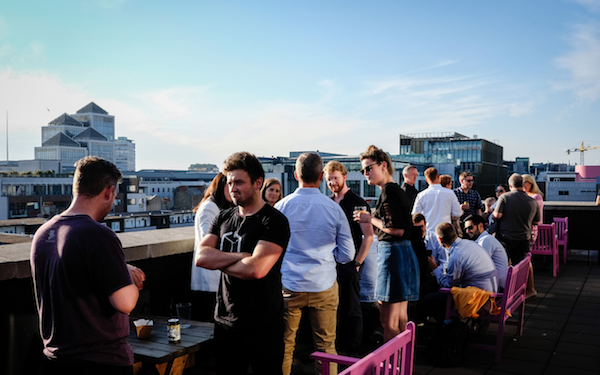 Our Huckletree D2 rooftop terrace offers views across the city’s famous Silicon Docks with a welcome side order of Dublin sunshine (or cloud cover). Aside from mood-boosting Vitamin D, heading up for a burst of fresh air really helps you focus. If the alfresco way of doing things captures your eye, don’t miss our regular Startup Sea Swims. Remember: wetsuits are for wimps. 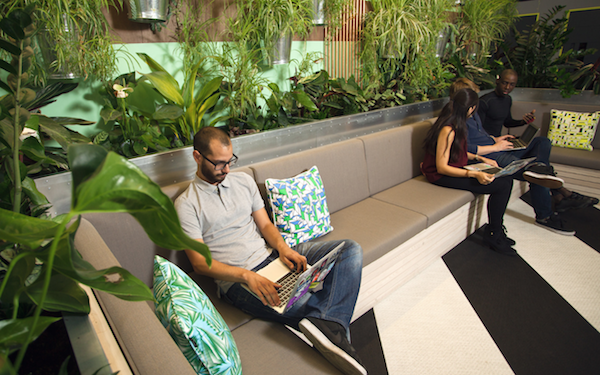 Plants in the workplace boost happiness. Bonus: if you’re a terrible plant mum (guilty as charged), you can enjoy their presence without the looming guilt that they’ll soon be dead by your hand. The Zen Garden is a peaceful haven when you’re in need of a little solo thinking time, complete with plenty of foliage and some pretty enviable wallpaper that’ll go straight on your Pinterest board. 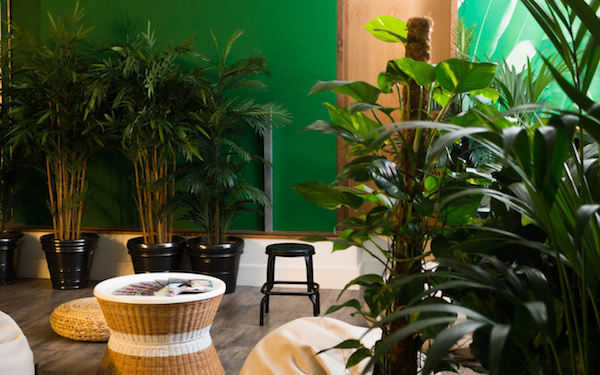 If you headed over to SaaStock earlier this year, you’ll have spotted our pop up Zen Garden. A taster of the real deal back at the Academy, it offered a chilled out space for attendees to meet up, step away from the madness of the conference and even indulge in a little seated yoga, too. Feeling curious? Book your workspace tour at your nearest Huckletree in London and Dublin now. See you in the Vertical Garden!